As search marketers, I think sometimes we underestimate the power of understanding our visitors. One way we can do this most effectively is through keyword research. Essential keyword research not only helps determine the success or failure of your whole search marketing campaign, but it can also provide a way of understanding your visitors and their intentions. Together, these points help define a winning SEO strategy. If you have read about traditional keyword research, you are already familiar with the basics: keyword suggestions, search counts, level of competition, misspellings, and so on. The focus of traditional KR is to find relevant keywords that are also good opportunities (i.e. have low competition and enough search demand). In this post, as has been my practice on this blog, I am going to dive deeper and push the limits of current keyword research. Carefully tailoring your content to your target visitors will provide you an edge most search marketers are currently missing. The most important element of keyword research is understanding your visitors. You have to know enough to lead them directly to where the content they are searching for is. Additionally, you want to make sure that content is tailored to the visitor’s needs. When do they want it? Where do they want it? How do they want it? I am sure many search marketers don’t include this in their keyword research. The idea here is to better understand your audience: age, gender, nationality, etc. Different audiences require different writing styles and approaches. You can maximize the potential of every click when you incorporate relevant changes into your web copy. Some search engines, such as AOL or Google, offer personalized search that assigns a user identifier to each search query. 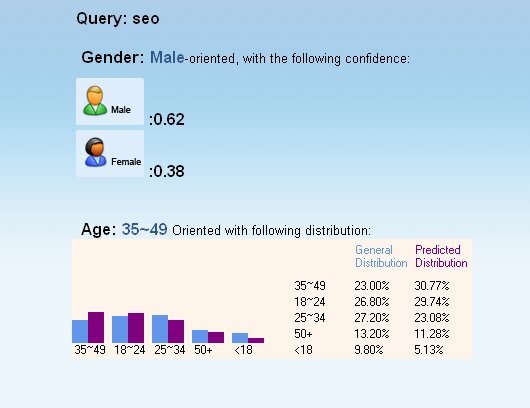 With that information they can pretty much tell exactly which subscriber is doing the search, providing greater context into what he or she is looking for. Unfortunately this information is not available to marketers. There is, however, a nice little tool in MSN research labs that can predict visitor demographics and is as close as you can get. There are several tools we can use, some pull their data from meta search engines or ISP logs, but my favorite is still Google’s. What better database than the one that commands more than 50% of the market? Unfortunately, as I’ve explained before, it is not easy to tell what a visitor wants. Visitors’ searches are sometimes very ambiguous. How can we organize our research if we don’t really know what the search implies? One way search engines try to decipher this is by offering semantically related queries. They use a technique call clustering to do this. We can use MSN labs’ tool to help us identify semantically related keywords. Most keyword research tools provide information based on the previous month’s searches. The information is definitely useful, but people change their preferences all the time. Knowing what was popular yesterday doesn’t necessarily mean it will be popular tomorrow. The best way for us to do better research is to complement it with some search prediction. My favorite tool for this is Google Trends. Understanding where the customers are doing the search is also extremely important. Not only can it help provide better context for searches, but it can also help define the content, product availability, shipping plans, and other considerations. Thanks to geo-location technology it is very simple to detect the physical location of any web surfer via his or her IP address. Search engines use geo-location information a lot. You can specify physical locations for your keyword searches in the Adwords keyword tool, but the most useful tool for search marketers is Google Trends. Visitors expect the content, or whatever they are looking for, to be presented in some pre-conceived way. One way to understand how they want the information is to understand in what stage they are in the search process. Are they using generic searches, brand searches or action-oriented searches? Each type of search brings visitors with differing intents. For example, you may want to use a different tone for a visitor coming from a generic search than a visitor coming from a brand search. Each user is seeking different information. 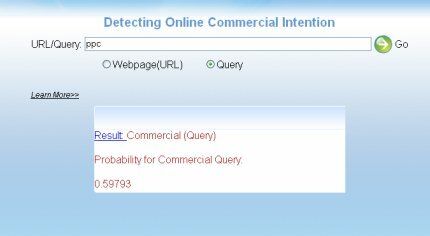 Again, the nice folks at MSN labs provide us with a nice little tool that can classify search intent automatically! Another useful piece of information is a list of searches performed by the visitor before the current one. That can provide more relevant context to the current query. Here is another useful tool to help us dig out that information. Understanding why somebody is searching for something could give a marketer and seller the ultimate competitive advantage. It would be like being able to read your visitors’ minds. But while it is a fundamental question, there is unfortunately no tool I know of that can answer this question. We might assume someone doing cancer related searches has the disease, but it is not unusual for a relative of a patient, or a biology grad student for that matter, to do the same. The question of “why” cannot easily be grasped. Will search engines be able to answer this question one day? It will be difficult, but I believe that as more of life’s activities become digital, and as search engines gain more access to our digital footprints, the more likely their chances of building a comprehensive and real time profile of our actions. Perhaps then, but as search marketers we still might not have access to such information. After you have figured out these questions you can then formulate a winning strategy. You must select the keywords with great value but with competition you can match or beat in a reasonable amount of time and with a reasonable amount of effort. The plan is to build a ladder of keywords. Once you achieve high rankings for the easier-to-reach keywords, you move up the ladder to more challenging ones. The ultimate goal is to reach the top of the ladder with the most competitive keywords. For branding purposes the value of your chosen keywords must be based upon search volume. The most searched keywords will provide the most visibility. For conversions, the value is in the cost of the clicks and the number of clicks they receive. The logic is that if PPC advertisers are expending so much per day on those keywords they must be very valuable. 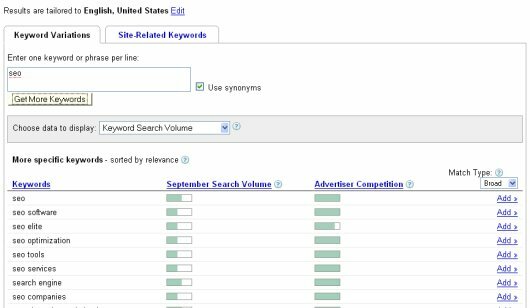 Another often overlooked source of keyword opportunities is targeting common misspellings of your chosen terms, competitors’ names/brands, related keywords or non-obvious keyword combinations. I usually think of success in three ways: conversions, branding or both. Conversions are simply actions you want your visitors to take once they arrive at your site: sales, signups, RSS subscriptions, downloads, social bookmarks, social submits, and so on. Branding is about getting your web site name well known and associated with your services and message. Google Analytics is an excellent and free tool that helps a lot in measuring conversion success. You must set conversion goals by indicating ‘success’ indicators on your web site or blog. For example, for my blog the RSS feed is a conversion goal. So are the social bookmark, submit and vote buttons. These are the ultimate actions I want my visitors to take. On the other hand, the primary purpose of my blog is to help build my personal brand as an authority in my field. That is the easiest to measure by the number of direct visitors to the site, and the visitors coming from brand searches (“Hamlet Batista”). Great article Hamlet, reminded me of some points that I sometimes overlook when doing my keyword research, but I'd be happy to refer someone new to SEO to this article for a great start on choosing keywords! I find the hardest part is just knowing when to stop! Once you've started putting the different permutations of all your selected key words together you can easily end up with thousands of phrases with varying copetition, all of which could apply to your site! Hi Matt, Thanks for your comment. My approach is to start with the less competitive ones and move up. Trying to work on so many keywords at once can be overwhelming and is harder to measure results. Thanks for listing all the resources in one post, Hamlet. I've had to bookmark this for future reference, as it's right on topic for what I want to learn more about. Thanks, David. I am glad you enjoyed the post. That's a pretty awesome post Hamlet. I didn't know that tools to give you the 'how' existed. This is a great way of thinking about keyword research. So far in my simplistic efforts I have been too highly focused on just volume and competition. Another factor that is important (but not necessarily relevant to the understanding of your visitors) is figuring out if you can rank for the term in a natural way. A lot of people (for the longer phrases) anyway tend to start narrow and just add words so you end up with a phrase such as 'back pain cure oregon cheap'. How can you incorporate a term like that naturally into your copy so you can rank well for both visitors and engines? <blockquote>How can you incorporate a term like that naturally into your copy so you can rank well for both visitors and engines?</blockquote> That is an excellent question, Caroline. You can write your content naturally and the search engine will identify the keywords. This is possible because modern search engines measure the proximity of the words in a multi-word keyword. The words can be in different order and they can still identify them properly. You could rank easily for terms such as 'back pain cure oregon cheap' without have the words in a string. Even if they were sparsely spread across your page you would probably still come up. A lot of people are quite happy to coat their site in H1 tags full of spammy text like this, but I don't think it is a good idea. I would not touch a company that used such text on their site. Very insightful post as well as nicely written. I've been tinkering a lot lately with Microsoft's ad lab and find it fairly useful. I would take the information to the bank but it is great qualitative information for spotting trends, etc., which is also what Google Trends helps with among others. Great job, always exciting to see new and innovative techniques for tasks that can have a tendency to get stale. When I say stale, I mean doing the same basic steps time and again without any deviation or new methods. A ton of great stuff, Hamlet; it's going to take me a couple of hours just to try out the MSN labs tools. People have really been talking up your blog on SEOmoz, so I thought I should check it out; seems like they were right. Hey Dr. Pete! Glad to see you here. I'm glad you like my blog. Tom has been helping me a lot on promoting my blog to the Mozzers :-) Now, I have to work twice as much, to produce good quality posts. BTW, I enjoyed your article on usability. I downloaded the PDF and I also plan to hand it out to my team. Thanks for sharing! If by "sharing", you mean shameless promoting myself then, hey, no problem :) Glad you enjoyed it. I'm really interested in the strategic side of usability and interfacing disciplines like analytics and SEO. I've really enjoyed discovering some of the up-and-coming blogs like yours, and seeing how hard some of my fellow bloggers work really makes me redouble my own efforts. Thank you for the resources. I have used quite a few, but wasn't aware of the MSN resources. I'll certainly will make use of them. Janna - Thanks for your comment. I hope you find them as useful as I did. Another great post Hamlet. Like some of the others I wasn't even aware of the msn tool; incredibly useful!! Brilliant and what and incredible information with great research and insights to keyword research. Very good article you got here. Very informative. Thanks a lot. I'll bookmark this for my own reference. I'd also try to refer this to some of my friends. Thanks for the info! Geoff - I am glad you liked it. Oh my god what a great post. You just gave me 90% of what I was looking in order to look like I know what I'm talking about in front of my manager and the marketing guys. Time for a techie to step up and tell those marketers how it is :) (dont worry I'll quote your blog, I wont pretend this is all my research) already subscribed to the blog, which I find amazing. Thanks! This is a nice lesson on keyword research. Too bad wordze aint free. I think its the best. This is a great article, like other people i wasn't aware that the msn resource was there, ill start to make use of this information and let others know about it. Thanks for sharing! I definitely think google trends and google apps are still the best way gather data to effetively climb the serps. Although the msn one is pretty new to me. Thanks for the resources. I like this information. You mention about different writing style for different age of people. Hm...could you provide some samples? One thing I realize in writing is that it tends to convert better when I write about what benefits a product can give you instead of writing about product features. I usually end up with more good long tail keywords than I can handle. The key is to pick out the golden nuggets from those. You really do need software to help in this task. like them both, google trends and google apps, for me it's pretty new too, the msn one. nice post, thanks for the resources. Excellent article, I know it's been up for a while, but just letting you know the msn labs link under 'what do they want' is no longer working. Also I'm not so keen on the google adwords keyword tool now that they're producing results that they deem profitable, it makes it extremely difficult to find longtail phrases with it. I enjoyed this - will heed its advice! Thanks Hamlet, great post and a lot to think about. It is so easy to concentrate on traffic when it really pays to concentrate on giving people that have a need what they want. 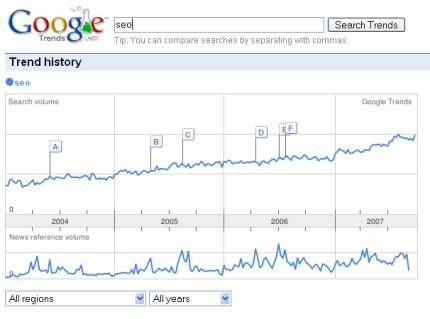 Great article and I agree how important keyword research is. Lots of marketers optimize a website for a keyword without understanding what people are searching for. Then they wonder why they get traffic but no conversions. I've actually been using all these tecniques for a couple years now. Some other great tools are quantcast, compete.com, and alexa, which will let you dig deeper into demographics, etc. Great article! In the field of SEO,my clients always asks for the best keywords. I often confused with that. But after reading this I am getting confidence to do the keyword research. Thanks for your great post. Thanks for the easy to follow step by step process of Keyword Analysis! It was much helpful in understanding and devloping my on-going Keyword research...But i didn't understand..why do we need to get logged in Google Adwords keyword Research tool, what's the difference about being logged in Analysis and NOT logged in Analysis.